I'm home safe with Hammy and we're reunited with the Mister! It was a wonderful once-in-a-lifetime experience and I'm happy to be home! I'm interrupting my ongoing travel diary to present this scheduled post which came about as a result of a happy win at Case This Sketch back in April. I am honored to be here today as the Guest Designer for the current challenge! When I saw the sketch, my ancient wooden stamp called "Pecking Order" by artist Carolyn Shores Wright immediately came to mind. In the past I have colored the image with colored pencils, but for today's cards I used my KGT paints for their rich and creamy color. I used an oval frame for my sediment to mimic the plump little bird bodies. And then I was stymied by what sediment to use. I think I went through my very large sediment inventory three times round, but nothing really rang my chimes, so I set the card aside. A few days later I happened to be writing a note inside a "thinking of you" card. As I wrote to let my friend know she was on my mind, Hammy ran out from under my arm and pointed at my CTS card which was sitting there. Aha! A perfect sediment to send a caring card and also punny because that poor birdie holding the sediment has three other birdies literally ON his mind! And since I couldn't find the exact stamp I wanted in my collection, I just wrote it out by hand. While I had my paints out for this detailed stamp, I took the trouble to paint two images. For my twofer, I fussy cut the image and trimmed it to fit the card base, nestling in my vertical "thank you" sediment from Endless Creations. I hope you will be able to join the challenge with your own unique take on the sketch! There are so many possibilities! Click over to CAS(E) This Sketch! to see the other incredible cards from the Design Team! As soon as I can (allowing for jet lag), I will be back to continue with my last few days in England! Oh Darnell it took me a few seconds to 'see' what the image was, but how I smiled when I realised what it was, and paired with the punny sediment I nearly burst out laughing - just as well I did not as the grandies are barely asleep, and I would hate to wake them as babysitting means an evening to myself ;-). Congrats on your GD post, Darnell. Your card is super-fun and your colouring is so beautiful. Those images go perfectly well with the sentiment. I hope you are doing well. Hugs. Welcome back!! Glad you made it home safe! Gorgeous cards! That stamp is a hoot and perfect for the sentiment. You have nice handwriting and could be making your own handwriting fonts! I'm glad you and Hammy are back safe. Rest up, then catch us up on the rest of your travels. Hugs. You have so inspired me to take a few moments today, and send out a few cards. I do adore those birds for ages ago. I think some of my very favorite stamps are my oldest. Glad you are home safe and sound, and that you had a very eventful trip! Hi Darnell! Welcome home!!! I think I actually saw you on your fly-by - there were heart-shaped contrails - must have been you!!! I am so happy to have you joining the team this week - your card couldn't be more perfect, and perfectly adorable ... on my mind indeed!!! So glad you're back, safe & sound. Congratulations on your win! That must be exciting! Your card is wonderful. I love the birds. Now, get some rest & take it easy! Welcome home. I've been following your trip. Sounds like lots of fun. These blue birdies are so adorable. Just the right image for that sediment! Okay...still laughing at your card. Not for the construction, which is obviously meticulous, but this has to be THE PERFECT SENTIMENT for this image. And you hand wrote it...and it's perfectly legible...I am so impressed. Congrats on your guest design gig, so well-deserved. Oh yes, and welcome home. Did your suitcases get heavier after their trip across the pond? Your really looked like you were having fun. Glad to hear that you are back at home, safe & sound! Fabulous card to celebrate your GD spot! Love your trio of sweetly colored stacked birdies! 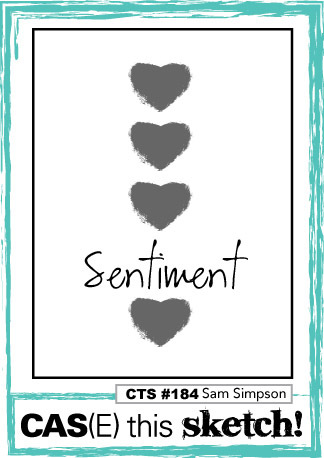 The vertical sentiment rocks! So pleased you are home safe and sound Darnell and I expect your 'mister' was so pleased your home....hope there wasn't too many dishes waiting to be washed and the laundry basket wasn't overloaded?? So happy you are back home safe in Mister's arms. :) Looking forward to hearing more about your trip when you are up to it. It's good to be quick witted when the right sentiment just cant be found. Yours is perfect for your stack of feathered ones. So glad you have made it home safe and sound. Jet Lag is a lot easier going west. Rest and welcome home. Looking forward to the remainder of your trip posts. Happy to see you made it home safe and sound and looking forward to reading & seeing the final legs of your marathon UK visit! Looking forward to reading more about your time here. Hi Darnell, I'm pleased to hear that you are returned at home safe. I had to look twice at the image and then I saw the funny birds hihi. I love the layout and the colouring on both your cards. Lovely vivid colours. Welcome home! My goodness what a trip! Congratulations on another GD team spot! What a fun and colorful image, love the fun and silly birds on this darling card! So glad you're home safe and sound! It was lovely to meet you on your travels. It seems like an age ago! Congrats on your GD slot. Love the card you've made for it. You certainly had the perfect stamp for that sketch! Two great cards, beautifully colored! What a cute stack of feathered friends! Congratulations on your win! I've enjoyed following your trip journal. I'm so glad you were able to enjoy that wonderful time and meet so many of our blogging friends. Truly a once in a lifetime event! 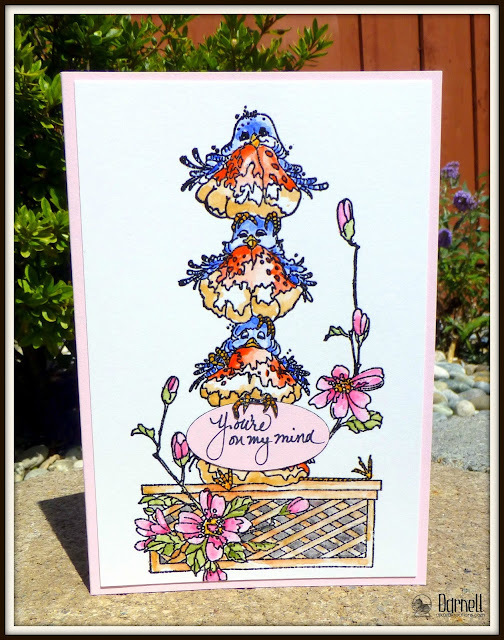 Such cute stacked birds and I love how you used them on your card designs. Congratulations on your new guest designer gig. And, welcome back home too! Yay for guesting! Your cards are fabulous!! Glad you made it home and are recouping from the AMAZING-time-of-your-life-trip. I can't believe how many stampers you got to meet! What a photo album you will have! So glad you made it back home safely. Really enjoyed your posts and pictures of all the ladies and gents you met. What a fun card and congrats on your win. Darnell, Welcome back to The States! Can't wait to see more of the travel diary. In the meantime, I'll just grab one more peek of these fun little birdies. Adorable! Gorgeous card Darnell, great image and colours. Glad that you arrived home safe and sound and that you enjoyed your visit to England, it was an honour to meet you. Glad to see you (and hammy) made it back home safe and sound Darnell and reunited with the mister. You will be able to chew his ear off with all the details of your escapades! Thank you once again for your company, generosity, and for being such a gracious host. How organised you are to have scheduled your lovely card before you left for your trip, and what a tweet card it is, love those stacked birdies and the perfect sentiment. You should have your own line of handwritten stamps. Hope you're soon over the jet lag! I'm so glad to hear you are back home and hope the jet lag will be gone soon. It was so great to meet you and wasn't the retreat fun? This card has you written all over it and I love how you coloured those cute tweeters! Take care my friend. I adore this card Darnell - so cute!! Glad you're home safe and sound - it was the happiest of times meeting you for those two days! Welcome home! I'm so glad you were able to take this trip of a lifetime, but I'm betting home sure feels good right about now :) Fun cards today with those stacked squawkers! I am so pleased that you arrived home safely, I hope it does not take too long to get over the horrible jet lag! I hope Hammy is not suffering too much either. It was such a great pleasure to meet you in real life, I have some wonderful memories now! You are such a kind and generous friend - I am still not sure how you managed to organise everything so perfectly. You are one amazing lady! Both cards are wonderful, I just love that really sweet image of the birdies and you have coloured them beautifully! The image is just adorable. Welcome home...loved seeing all your fabulous photos of your wonderful journey. Your card is so sweet and fabulous coloring too, just beautiful! Welcome home Darnell, so happy you made it safe and sound!! I'll bet the Mister was happy to see you!! Your cards are just as cute as can be. Love them both and so will the recipients! Congrats on guesting, you rocked the sketch!! So glad your trip was a happy success. Your cards today definitely made me smile. Those plump birds look absolutely huggable. Love the bright colors, too. Your handwriting is beautiful, by the way!! So glad you're home safe & sound, Darnell! What a super creative & wonderful use of the sketch! Congrats on the win in April! Glad you're home safe and sound. I bet your Mister is happy to have you home. 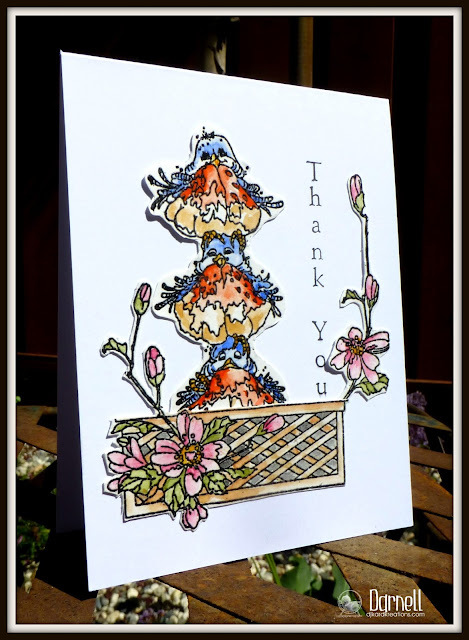 Gorgeous cards ..... what a fab image and beautifully coloured. So happy that you got back safe and sound and I will never forget our meeting! Your card is absolutely fabulous!! Amazing colouring! Well done on your GD spot too ... sending big hugs! Love this! Hope you're rested and recovered. So wonderful to have you guest design for us at CAS(E) This Sketch, Darnell! Your card is fabulous! What silly birds. That sentiment made me scream (quietly since I'm at work) because I got the literally on his mind gag. It's great that you had an awesome trip. Rest up and get back to that 'Murican time soon. Fun card, congrats on your GDT! Now I have to catch up with your travel diary... I did enjoy your FB photos - what a fun time you had! What a gorgeous take on the sketch! Welcome home. Oh welcome home!! It has been great fun reading all about your adventure! It is fun to see your Kard Kreations again! !these delightful little chubbies are colored perfectly friend! Congratulations on your win Darnell and welcome home!I thoroughly enjoyed reading about each leg of your journey of that fabulous trip. You were so fortunate to meet so many people and see so many sights. Loved all of your fun photos. I am exhausted from all that you did and I am sure you had a fabulous time but are likely exhausted for real. Love this card and that fun stamp so beautifully coloured! Welcome home Darnell! And what a treat of a card for us - love those birds and the rich colours of the paints. It's a stunner! Hammy. He has taken my blog over for August.